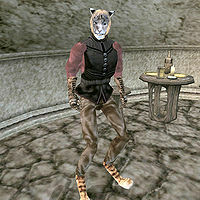 Thengil is a Khajiit thief found at the Council Club in Ald'ruhn. As an almoner for the Imperial Cult, you can ask him for a donation for the Buckmoth fund, but he is not interested in sharing the wealth. He is wearing a common shirt with matching pants and netch leather gauntlets. He is wielding an iron dagger and he is carrying three apprentice's lockpicks and 15 drakes. Like all Khajiit, he can see well in the dark and can demoralize others for short periods; otherwise he knows no spells. This page was last modified on 12 September 2013, at 04:22.